Will Sagar, SERDC, Southeast Recycling Development Council, Executive Director. Will Sagar graduated from the University of North Carolina with a double major in Economics and Mathematics. He has 18 years’ experience as County Solid Waste Director in two counties in Western North Carolina. He was in the first 500 operators to receive Manager of Landfill Operations. He has implemented a Pay As You Throw program and constructed the first lined landfill in the mountains of North Carolina. Will is a Past President of the Board of Directors the Carolina Recycling Association. For several years, he also chaired the Board of The Free Clinic of Transylvania County, which serves the medical needs of the uninsured. He works from his home in Hendersonville, North Carolina. Sagar has been with SERDC since 2010. Sandy Skolochenko works for the North Carolina Department of Environmental Quality’s Recycling and Materials Management Section. She has more than 5 years of experience working to advance recycling in North Carolina at the local and state level. Sandy and her team provide technical assistance, grant-making, education and outreach, and market development to help grow the state’s recycling infrastructure and improve the quantity and quality of materials that are delivered through public and private programs. Rhonda Rollins is an Environmental Scientist with EPA Region 4 in Atlanta. She received her Bachelors degree from North Carolina State University in Environmental Science and Economics, and a Masters Degree from Duke University in Environmental Management. Prior to EPA, she spent 4 years consulting on air & water issues for a wide range of industries. Rhonda has been with EPA for almost 15 years, spending the first several years enforcing industrial hazardous waste regulations. Now, she works with Voluntary Programs (which she often calls the warm, fuzzy side of EPA) to facilitate recycling, reuse and energy conservation within industry, government and individual homes. As Program Manager of the State’s Materials Management Program, Larry leads Tennessee’s efforts to reduce waste destined for landfills and management of difficult problem wastes. His programs provide a range of technical and financial assistance to local governments, NGO’s, and industry to include HHW, Recovered Materials, Used Oil Management, Data and Reporting, Tennessee Training Academy, Urban Green Lab, and the Tennessee Materials Marketplace. His grant program obligates over $10 Million in grants per year to support these efforts. His vision directed the development of the State’s new 2025 Plan that now charts a pathway to success. At the national level, he leads the effort in collaborative data sharing and measurement between states. He is currently working on efforts to earn a Master’s of Science in Supply Chain Management. A native Atlantan, Gloria Hardegree is serving her 19th year as Executive Director of the Georgia Recycling Coalition (GRC), the state’s 501c3 recycling organization now in its 27th year of operation. Gloria has been in the recycling industry since 1990, and throughout her career has been involved at the local, state, regional and national level on advisory boards and steering committees. Prior to joining GRC, she was a partner in a yard trimmings composting company and implement some of the early curbside residential recycling programs for a local hauler in metro Atlanta. She holds a: Bachelor’s degree in Education from Oglethorpe University and a Master’s Degree in Educational Curriculum & Instruction from Georgia State University. Suki Janssen is Director of the ACC Solid Waste Department and has been with ACC for over ten years having the position as Waste Reduction Administrator for Athens-Clarke County, Georgia until July 2015. Prior to her position in Athens-Clarke County, she was a Program Coordinator for the Keep Georgia Beautiful program within the Georgia Department of Community Affairs, Office of Environmental Management. She is a certified middle grades teacher (having taught 7th and 8th grade science in Cobb County for five years), past Georgia Recycling Coalition President and board member and current Northeast Georgia Regional Solid Waste Management Authority board member and Solid Waste Association of North America Georgia (SWANA) Chapter Vice-President. She is a SWANA certified Landfill Operator and Class Instructor since 2005 and SWANA Recycling Systems Manager certified since 2007 and Composting Programs Manager certified since 2013. She is a Georgia Master Gardener, Master Composter and Master Naturalist. She is married to Chris Janssen a middle school math teacher in Oconee County and lives with three dogs, one chinchillas and five snakes. Kurt Schmitz with Pratt Recycling has filled many roles within the organization from Operations to Sales and Marketing. Kurt’s team is currently responsible for procuring over 900,000 tons of recovered fiber annually for Pratt’s Conyers, Georgia and Shreveport, Louisiana 100% recycled paper mills. Kurt’s team also markets additional 400,000 tons annually of both recovered fiber and non fiber materials. Pratt Recycling operates 13 recycling plants in North America. Siz of these facilities process Residential Single Stream. Bill has worked for 30 years in the oil field equipment manufacturing industry. In 2007, he joined Reflective Recycling Inc. and was a partner in BevCon, LLC., a beverage container collections company. He joined Strategic Materials in 2017 as Regional Sourcing Development Manager where he is responsible for Southeast US supply. Bill studied Materials Management at Houston Community College, Industrial Technology at Ohio University and Mechanical Engineering at Columbus State College. Bill is certified in Production and Inventory Management (CPIM) and is a Certified Purchasing Manager (CPM). I have worked for KW for a total of 6 years. I worked in quality for our container division before moving to the Procurement team. My job is to manage the procurement and inventory of Polypropylene at KW Plastics. I work with our team to increase the volume and quality of curbside collected across the U.S. as well as working to supply the best customer service to the suppliers of KW. As Corporate Director of Sustainability and Product Stewardship at Shaw Industries, David Wilkerson is responsible for identifying, planning and leading key sustainability initiatives for the expansive portfolio of flooring products the company manufactures and distributes including carpet, hardwood, laminate, resilient, tile and stone flooring. In this capacity, he works closely with the commercial and residential sales and marketing teams as well as Shaw’s corporate communications department and product innovation group to advance the company’s sustainability efforts. David is a member of Shaw’s Growth and Sustainability Council and serves on the Residential and Commercial Strategic Business Teams. Chip Koplin is a 30 year veteran of the scrap recycling industry and is currently a freelance public and government affairs consultant. He was co-owner of Macon Iron and Paper Stock Co. in Macon, GA, a family owned scrap recycling company founded in 1919that was sold to Schnitzer Steel Industries in 2010. 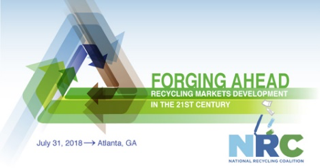 He is a past president of the Georgia Recyclers Association and the Southeast Chapter of ISRI and is also a member of the Georgia Recycling Coalition. He served as chairman of several ISRI national committees, including Materials Theft Task Force, Trade and Communications. He has many years of experience advocating for the recycling industry on numerous issues. He organized the Macon-Middle Georgia Metal Theft Committee, which became a national model for cooperation between recyclers, law enforcement and other stakeholders. He is former President of the Macon Rotary Club, a 2009 graduate of Leadership Georgia, serves on the Board of Directors of the Georgia Chamber of Commerce as well as the chamber Government Affairs Committee. By coming together with a global voice that promotes compost, International Compost Awareness Week is a call to action. The 2019 ICAW theme, “Cool the Climate – Compost!” recognizes the connection between soil health and the climate. Soil plays an important role in our environment. Healthy soil is at the heart of planetary, agricultural and human health. This year’s theme highlights that soil management practices with compost is key to soil health and migrating climate change. By composting, we return nutrients to the soil, help capture carbon from the atmosphere, resist drought and disease and provide fresh air. Call for Nominations – 2018 Texas Environmental Leadership Awards! Do you know of individuals, communities, organizations, or businesses that are developing and maintaining programs to make Texas a more environmentally conscious state? Through Friday, August 17 STAR will be accepting nominations for the 2018 Texas Environmental Leadership Awards. This award is to recognize the champions and stewards of environmental change in Texas! Winners and honorable mention will be recognized at a special ceremony on the evening of Tuesday, Oct. 30, at Moody Gardens Hotel in Galveston as part of the annual Texas Recycling Summit. Recycled materials and trash should look very different from each other, but for years they have been converging in the U.S. China has not been the creator of today’s crisis in the industry – U.S. mills have been complaining for years – but China’s recent embargo of U.S. recycling imports is shining a mirror on our recycling industry and providing a clear signal that we can no longer pretend diversion of waste into a recycling bin is recycling. Material Recovery Facilities (MRFs) can produce quality materials out of both single stream and dual stream inputs, but not when 20+% of the input “recyclable” stream, in some cases, are not recyclables. A combination of “wishful recycling” and insufficient enforcement of quality is proving very damaging to the industry – abysmal and volatile markets, a dirty product that is not a reliable “commodity”, closed plants, and programs that are hurting economically. We cannot continue to act and behave as if business as usual will offer a solution to today’s issues. We must fundamentally shift how we speak to the public, how we collect and process our recyclables, and what our end markets accept and utilize to truly recycle. Look for our next workshops coming to the Midwest this fall. The second year of the Northeast Recycling Council’s (NERC) NERC Environmental Sustainability Leadership Award competition has begun. The award will recognize an individual or organization for the impact they have made on sustainable materials management within the NERC 11-state region. Applications for the will be accepted through September 12. To be eligible, an organization or individual must be located within NERC’s 11-member states: Connecticut, Delaware, Maine, Maryland, Massachusetts, New Hampshire, New Jersey, New York, Pennsylvania, Rhode Island, and Vermont. A copy of the application can be downloaded here.